"This beer is an imperial version of Alter Ego. It is intensely kettle and dry hopped to produce a pungent and flavorful Double IPA that is super pleasant to drink. It is simply and easily described as a juicy and dank citrus bomb." Pours a hazy dark orange (a little rusty) with a finger of white head. It's pretty dank on the nose and has some black pepper spice. Peaches and other pitted fruits are big as well. A nice pop of hop oils are at the front of it all. A sweet juice extract helps lighten the load of bitter hop oils. If I remember correctly (and I like to think I do), the base Alter Ego is Julius, but the twist was different hops in the dry hop process. With this imperial version of Alter Ego, I can still detect the base juiciness of the Julius, which makes sense with how sweet the fruit is. I think the Mosaic is kicking in that familiar cedar and wood, but it has a sawdust quality to it this time around. Near the back end, the dankness come forward and leaves residual bitterness on the finish. As compared to Alter Ego, I don't think the flavors are THAT much more intensified, but it is still delicious. You can tell this is a slightly more, goes to 11 version of AE, but perhaps not on that next level. Mouthfeel is perfect. It's soft and not too heavy. At 8.2%, it's worthy of the DIPA name, but doesn't weigh your palate down and has no alcohol presence. 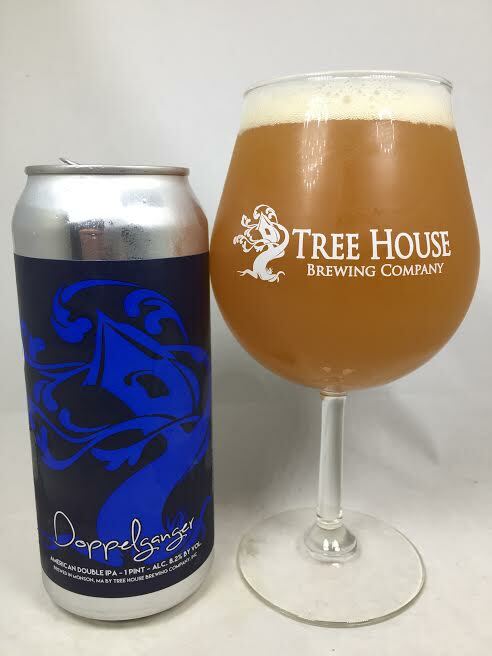 Doppelganger may not have taken the base Alter Ego to new planetary heights, but it is impressive as a juicy, dank, and easily drinkable DIPA. Tree House just cranks out these great IPA's on a regular basis and this is no different, so yeah, it's no surprise that it delivered again.I'll give it a slight nod over Alter Ego as the beer is overall more enhanced, but still maintains the drinkability of a smaller beer.